Gives skin a natural, shine-free finish. Invisible shade is colourless and works on all skin tones. Like all Laura Mercier setting powders, it has a soft-focus effect that subtly blurs the look of fine lines and imperfections. Sets makeup so it doesn't settle into fine lines or pores. Laura recommends applying with the Fan Powder Brush (sold separately). Start by sprinkling a little powder onto a clean flat surface, like the top of the powder lid. 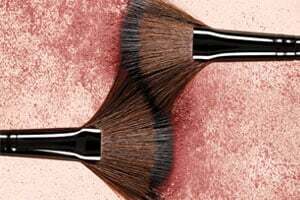 Dip the Fan Powder Brush into the powder, picking up only a small amount—a little goes a long way. Gently apply to skin in a light sweeping motion. Around eyes, use Secret Brightening Powder For Under Eyes.